The fish symbol was embraced by the Early Christians as a symbol of fidelity to the Christian faith. Christ was known to describe his disciples as “Fishers of Men” and many of his followers were indeed fishermen by trade. Eventually, the Greek word “Ichthus” which denotes “fish” or “fertility” was re-purposed as an early acronym: "Lesous Christos Theou Uios Soter," or "Jesus Christ, the Son of God, Saviour." 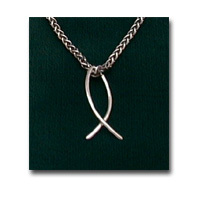 The legend has it that upon meeting a stranger, early Christians used to swipe one arc of the “Ichthus” in the sand. If that stranger was also a follower of Christ, they would complete the diagram, thereby signifying that they could be trusted, and it was safe to speak of more “spiritual” issues. "We, little fishes, after the image of our Ichthys, Jesus Christ, are born in the water."